The album I am reviewing today is not patently new. 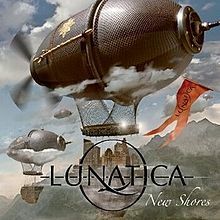 Released in 2011, Lunatica's "New Shores" is an album that has consistently impressed every time I have listened to it. Lunatica is a Swiss symphonic rock band similar in style to Within Temptation or Epica. Thier sound is less symphonic and less metal than that of their peers, and the vocal style is decidedly not operatic. That said, I stepped into this album with a small amount of trepidation. After all, with a name like Lunatica, you don't find yourself itching to pick up any of their material. "New Shores" is a more polished, mainstream version of the sound Within Temptation produces. The vocals are not the greatest but they are melodic enough to be beautiful. Mostly progressive-styled rock riffs and rythms temper the symphonic keyboard sounds throuout this album. The drumming is chunky and precise. As with most so-called symphonic metal bands, Lunatica's sound is nothing ground-breaking. It is a slimmed-down and more accessible record from the start. I know this has been a somewhat brief review, but there isn't a great amount to say about this disc. It is a good listen if you are in the mood for some rock music with symphonic elements, but does not break any new ground. Thus, I wouldn't put this album in the 'great' category. However it is definitely 'good' in my opinion. Take a listen to Into the Dissonance below. Enjoy!